What is one of the biggest niche areas on eBay? It may surprise you to find out that there is huge demand for Information Products, and that they are one of the hottest markets on eBay selling in enormous quantities day in day out. 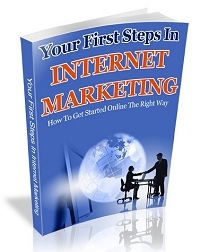 In this complete business blueprint I reveal the strategies that the smart sellers use when selling Information Products on eBay. How to obtain products to resell for FREE! This must certainly be one of the easiest eBay businesses to set up and run that there is. In “How to Profit from Selling Information Products on eBay” I give you the complete blue print to build your own successful eBay business. You would be forgiven for thinking that this information would cost you an arm and a leg, and from other sellers it would do but I believe in delivering massive value in my products so I am releasing this bad boy for less than the price of a visit to McDonald’s. Click the graphic link and find out how you can have your own eBay business up and running in a few hours! You only get one opportunity to create a first impression! It’s as true in life as it is in business. So how do so many people get this wrong? 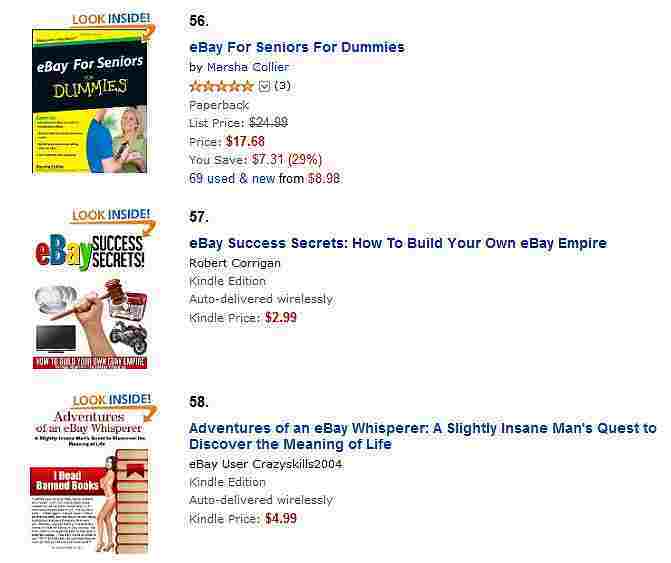 If you are selling low cost items on eBay such as a $1-2 eBook then the figures are very important. You could be left with only a few dollars or cents for the work that you have done. When I wrote my e-course Plugin Auction Profits, I decided to check out my opposition and bought a few eBay products from clickbank and from eBay itself. The eBay ones were low cost products the most expensive being $5. The $1 products where not worth the $1 which is what I suspected, but I was most surprised that the most expensive at $5 was also the shabbiest. It was sent in a plain blue mailing sack with my name and address scribbled on with marker. Would you ever buy from that seller again even if what you bough was of a good standard? Probably not, no scrub that definitely not! You see these sellers missed the most important part of this they were after the sale, just the sale instead of offering great value and building a relationship with your customers who would then go on to make further purchases. Just think if you bought a $5 product and that product was shipped in a CD or DVD case with a cover label the CD was authored as an interactive CD and if your purchase was far more in valuable than the $5 that you had paid. Would you come back for more? Too right! By spending just a few dollars initially you can build that wow factor into your products. If you are proficient at photo shop or similar graphic packages you can design your own labels, DVD/CD covers and eBook covers. If you are not proficient at photoshop simply outsource this work to a freelancer on eLance or a similar site. Or use Fiverr for your outsourcing requirements. You will find a whole host of vendors that will produce these for you at only $5 a job. The small investment is easily justified by the fact that you can use these items forever in you listings and in packaging your products. 10 Guaranteed Ways to Kill Your eBay Business Dead! Just follow the simple advice given below if you want to kill your eBay business stone dead. Building your business can be hard work, very hard work, but do you know what is easy? Killing it stone dead is easy; all you will need to do is follow my 10 point plan to success. This is easy! Just lie about the product you are selling, if it doesn’t work just say it does, if it’s not in perfect condition say it is. How easy is that to start with? Incidentally your customers will hate you but hey you could even get banned from eBay so no need for the other 9 points. Don’t bother posting your items until you feel like, after all everyone knows the postal service is slow and patience is a virtue so don’t bother putting yourself out just let them buy from someone else. Don’t bother about planning the end time of your auctions, if anyone wants your item why can’t they stay up until 3 am just like you, even less work to do. Find some real rubbish to sell and try and squeeze every cent you can, after all it’s well know that people pay top prices for garbage on eBay. Any old listing will do make sure that you never spend more than 5 minutes on it. Don’t forget the gaudy colours and the “cool” fonts and ALWAYS USE CAPITALS. If you really want to impress, find some poor animations and some low quality audio. Make sure that people remember your listing. Never reply to e-mails, I mean its all in the listing isn’t it. Surely people can just read it. Don’t add a photo, too much work, if they want it they will buy it anyway. If you do add a photo make sure it is blurred and the lighting is poor (you may have to wait for exactly the right conditions for this). Write a short description like this. Saves loads of time. Never give a discount, the cheek of it! What’s the problem with paying for two lots of postage, discount for multiple purchases if they want that they can go elsewhere. They will. Don’t list your items for sale, just as easy as the first. You can them blame everyone else because the item did not sell first time. eBay is THE marketplace, you can buy and sell almost anything to almost anyone. It, therefore, provides an unrivalled way to make money quickly and easily without the tedious commute, the long hours, the unsympathetic boss. Most people are excited when first discovering this vast and vibrant marketplace, excited but confused! “What do I sell?” is the most common question budding eBay entrepreneurs ask when faced with the thousands of eBay categories. Stuart Turnbull faced the same challenge 4 years ago before he chanced upon the basis of his strategy. He spent the next 4 years researching, testing and refining his idea into a plan that ANYONE can follow to make incredible eBay profits. 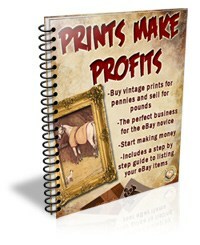 Stuart is now revealing the secret of his success in Prints Make Profits for less than $20 you can be running your own successful eBay business. No special equipment is required, you can be up and running within days for a few dollars and an hour or 2 a day is all that is required to operate this business successfully. This must be one of the easiest business start ups ever. Why Do I Never Make Money On eBay? I think of all the questions I get asked about eBay this in the most common. I think that all too often we get seduced by the “eBay myth”. “eBay is a licence to print money”, well if you are a share holder it is, but as a user it is more complex than this. The myth and the reality are quite different, let us take a few scenarios and examine them in more detail. Myth: Put anything up for sale on eBay and it will sell. Reality: Less than half the items for sale on eBay will sell on the first or even second attempt. Myth: Look for the “HOTTEST” selling products on eBay and sell the same, you will make money. Reality: Unless you are an established seller don’t try and compete in the areas of high competition, don’t try to run with the “big dogs”. Some categories and sub categories have dozens of competing pages and thousands of competing products. These big powersellers have huge powerseller discounts from eBay and can buy in there products in bulk at a much lower price than someone who is trying to muscle into the market. This makes your profit margins razor thin or even non existent. Myth: You can only make money selling product that are well known brands. Reality: There is a vast market for non branded products on eBay (and Amazon). Non branded products can be sourced cheaper, sold cheaper and yet make more money than the branded product. Inside there is an example of how to research a niche, for it is in the niche areas that the profits are to be made. 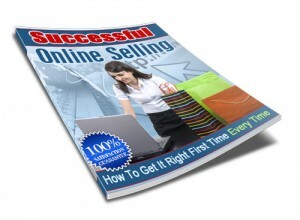 Download your FREE report “Successful Online Selling” now are find your own profitable niche areas.